Always Better Lives puts people at the centre of everything we do. We create cars that let people live cleaner, safer, less stressful and more connected lives. We develop smart mobility solutions that connect people, vehicles and the city in order to dramatically reduce congestion and pollution. We operate a business that is profitable, sustainable and a great place to work. 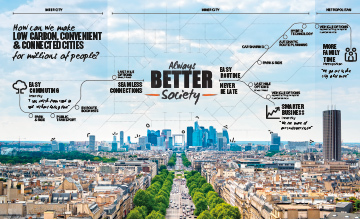 Always Better Lives: it is what Sustainability means to us. Sustainability is fundamental to how we do business at Toyota as expressed in our Global Vision to deliver products and services that respect the planet and enrich the lives of communities. The very nature of our operations makes us significantly dependent on a variety of resources and we see it as our duty to conserve them and manage our ecological footprint. We are proud of our record as a pioneer of environmental technologies and we believe that there is still much more we can achieve. For this reason, we have set the Toyota Environmental Challenge 2050. With six challenges that cover every aspect of our business, we commit to new and bold steps in the coming decades to go beyond zero environmental impact, towards delivering positive environmental benefits. In Europe, we continue our sustainability approach focussed on Always Better Cars, Always Better Society, and Always Better Business, leading to Always Better Lives as the overarching expression of our efforts. By putting people at the heart of everything we do, we aim to truly realise a sustainable society in harmony with people and nature. We strive to make Always Better Cars in quality, safety, environmental performance and driving pleasure. In Europe, our focus is on small and compact cars and recently we have launched two important models: the new Auris and the new Avensis. Both produced in Europe, they are evidence of our commitment to the region, as well as to our customers, delivering products that are better suited to their individual needs, while at the same time being safer, more environmentally friendly and fun to drive. 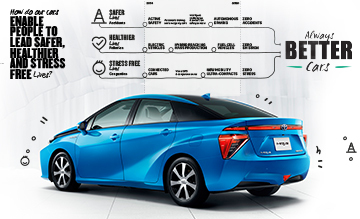 In addition, we launched the Mirai, the first Sedan Fuel Cell Vehicle, powered by hydrogen. Its extended driving range, zero emission and fast refuelling time make it the nearest thing yet to the ultimate eco-car. Looking forward, we are excited and proud to announce the launch of the Toyota C-HR, our first hybrid in the C-crossover segment. This will be the first car produced in Europe on our new platform: the Toyota New Global Architecture (TNGA). Conceived with the European market in mind the Toyota C-HR, with its coupe-style silhouette and the latest hybrid technology, has a great potential of becoming the new face of Toyota. We believe that green technologies and mobility should be affordable for all. For there to be a real impact, green technology needs to be widely used. For this reason, we have spearheaded the adoption of hybrid vehicles. As of today we have put 9.000.000 hybrids on the road worldwide, with 1.200.000 of those in Europe – nearly 1 in 4 of our sales is now hybrid. Looking towards 2020, we are aiming for a 50% total hybrid mix. At the same time, we continue to pioneer alternative solutions that address society’s challenges by pursuing our vision towards a Smart Mobility Society that connects private and public means of transportation in a seamless way. A great example is the Citelib by Ha:Mo project in Grenoble, where we are working with partners to study multimodal and last mile mobility with ultra-compact electric vehicles, including the revolutionary i-ROAD. To achieve our vision and long-term goals, we must be a successful business. For us this means creating a business model for sustainable growth. For example, one of our commitments is to contribute to communities by producing locally and hiring where we sell. Today we can proudly say that we are a legitimate local player, with 20.000 employees, 9 manufacturing plants and 30 sales and marketing organisations covering 53 countries. In Europe, more than 70% of our cars sold are locally produced. Furthermore, our dedication to make cars that are eco-friendly and help people have a stress-free life is paying-off. Our hybrid sales are currently about 25%, thus making it fundamental to our business. Through our vision for a sustainable business in a sustainable society, we have set for ourselves very ambitious goals. However, we are confident that through our commitment to create Always Better Cars, Society, and Business, we will be able to deliver our promise: Always Better Lives for our customers. 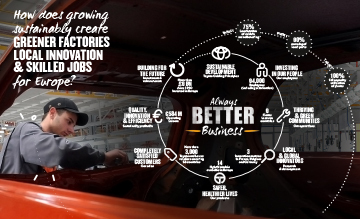 Sustainability at Toyota At Toyota, we approach Sustainability through a virtuous circle of Always Better Cars, Society, and Business. In this way we will create Always Better Lives for our customers. Sustainability Reporting More information about our stance towards Sustainability, and details on products, global operations and technologies can be found in our Global Sustainability Report. Note: Sales and market share results are reported on a calendar year basis (2015 results). All other KPI’s are reported on fiscal year basis (April 2014 until March 2015). Embodying our ‘fun to drive’ philosophy, the FV2 concept car points to a future world where car and driver are connected, both physically and emotionally, where the bond grows the more you drive it. And it would look perfectly at home on the set of a futuristic Hollywood film!